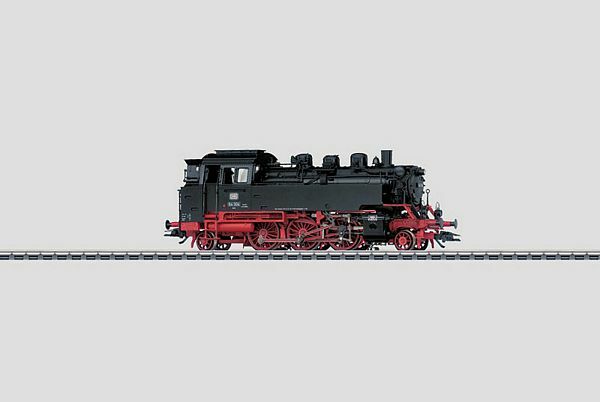 Prototype: German Federal Railroad (DB) class 64 steam locomotive. Model: The locomotive has an mfx digital decoder and Softdrive Sine controlled high-efficiency propulsion. It also has a compact design, maintenance-free motor. 3 axles powered. Traction tires. A 72270 smoke generator can be installed in the locomotive. The triple LED headlights change over with the direction of travel. They and the smoke generator contact will work in conventional operation and can be controlled digitally. Brake hose details parts are included with the locomotive. Length over the buffers 14.3 cm / 5-5/8. Different road number from that for item no. 39645.